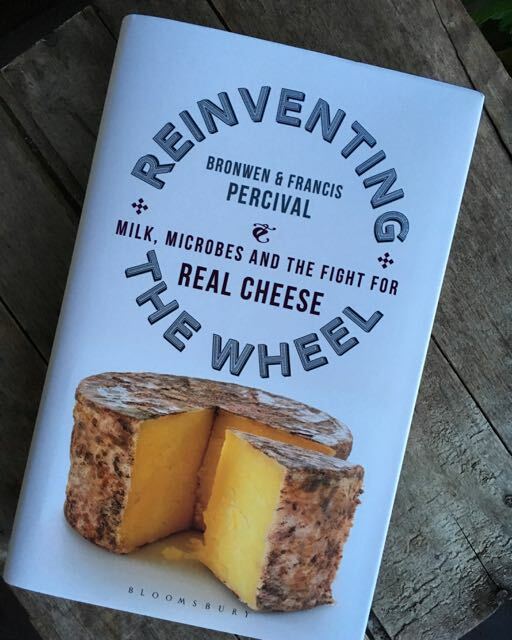 I confess as a cheese appreciator I had been looking forward to this book, but Reinventing the Wheel is not just for cheese lovers. It's a book for anyone who cares about the food they eat and the welfare of those who produce it. It tackles the wisdom of mega-dairies and industrialisation and the tension between modernity and tradition. Across 12 chapters, Bronwen and Francis Percival examine the culinary history, terroir, microbiology, sociology and politics of cheesemaking. We journey through 2,000 years of cheesemaking starting with the "feral", "primal" Salers cheese production on a farm in France's Auvergne region and the effect of the arrival of American factory cheese on British cheese production at the end of the 19th century. There are stories from dairy farmers forced towards consolidation, volume and efficiency for survival; Cheesemakers weighed down by legislation and bureaucracy, and other who have already fought the system and won with the help of microbiologists. We take in Microbes and Risks along the way. Reinventing the Wheel examines what has been lost as cheese production has 'progressed' in tandem with intensive farming and industrialisation. It's a tale of much loss but with reason for optimism for the future if we are prepared to learn from, rather than reject, the methods of the past. Bronwen and Francis Percival's book is a paean to artisanal cheeses. Cheeses that once all had a sense of place thanks to the healthy microbial communities specific to their geographic location, animal husbandry and production practices that contribute to their flavour and to their safety. This book reveals the truth about our current dairy industry and how science is revealing the positives of microbial activity. It's a beacon of light for those farmers and cheesemakers who want to seize on scientific facts to fight back against industrial homogeneity and rescue traditional cheesemaking. Reinventing the Wheel is a learned, fact-filled call to arms to scientists, health officials and legislators to work alongside dairy farmers and cheesemakers to enable them to produce cheese which is not only full of character but full of healthy bacteria. To work with good microbes that have a positive effect on our immune system rather than wiping out the good along with the bad. The book is aimed at the consumer too as, the Percivals believe, a lack of understanding of the cheesemaking process threatens the integrity of cheese. Labelling for instance is often misleading as "The label on the cheese is not there to help". In a world where "the word 'Artisan' can be, and is, used to describe just about anything short of a Dairylea cheese slice" the consumer needs to inform herself. We need a book like this which makes us think more deeply about our food, makes us demand real food.